Washington, DC, 16 March 2017 – Following global pressure on pet food companies, industry giants Mars and Nestlé have announced that they will take steps to ensure their pet food supply chains are free of human rights abuses and illegally caught seafood. Their commitments to act on transshipping at sea increase the need for global seafood giant Thai Union, a supplier for both companies, to eliminate any outstanding risks of human rights abuses and illegal, unreported and unregulated fishing in its own supply chains. Nestlé has committed to a full ban on transshipment at sea in its supply chains, while Mars has committed to suspend the use of transshipped products in their supply chains if its seafood suppliers cannot adequately address the human rights and illegal fishing issues associated with the practice in the coming weeks. 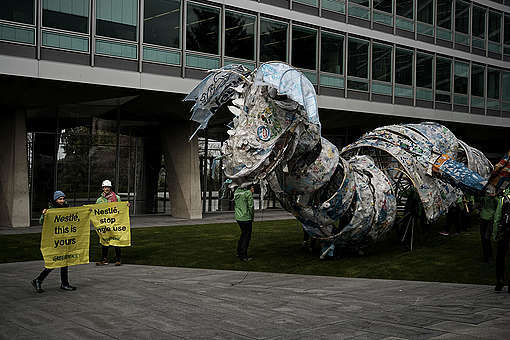 Greenpeace launched a campaign in 2016, Cats vs Bad Tuna, to demand that Mars ensure its supply chains were free of any potential human rights abuses. A Greenpeace Southeast Asia report, Turn the Tide, demonstrated the unacceptably high risk of tainted seafood entering numerous supply chains throughout 2016, including Nestlé and Thai Union’s. 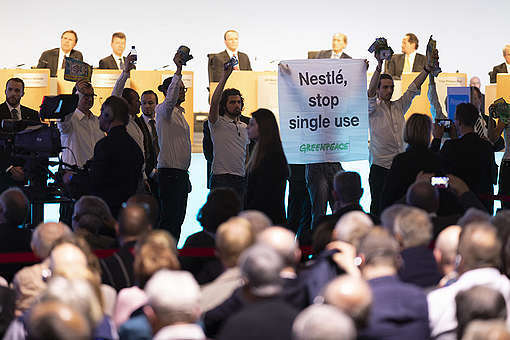 Nestlé immediately committed to address the concerns when they were raised in the report. Mars committed to tackle unchecked transshipment at sea in its pet food supply chains this month. Transshipment is a process through which companies move fish from one vessel to another, enabling them to remain at sea for extended periods of time to plunder the oceans, dodge regulations, and keep fishers as a captive workforce. In addition to its connections to human rights abuse, transshipment at sea provides an opportunity for illegal fishing vessels to unload their illegally caught loads into supply chains, away from port authorities. In 2015, an estimated 40 percent of these transfers happened on the high seas, outside of the jurisdiction of national authorities. Transshipment at sea has also been linked to other organized crime, including drug, weapon, and wildlife trafficking. Mars’ and Nestlé’s commitments send a strong message to Thai Union to address transshipment in its supply chains. Greenpeace is currently pressuring Thai Union to make sweeping changes for workers and our oceans across its seafood supply chains. Greenpeace has campaigned on Thai Union since 2015, and is asking the company to lead the seafood industry by ending transshipment at sea, addressing overfishing and destructive fishing, and increasing traceability from sea to plate. Today’s news follows a new report from Global Fishing Watch highlighting the problems with transshipment at sea. The report found that from 2012-2016, refrigerated cargo vessels participated in more than 5,000 likely transshipments. Concerns were raised about Mars and Nestlé supply chains in a 2015 New York Times investigation into human rights abuses at sea. Many of the famous internet cats from Greenpeace’s original Cats vs Bad Tuna campaign are featured in a new victory video celebrating the progress in the pet food industry. To watch the new video, click here or download it in the Greenpeace media library here. Nestle and Mars’ brands include Purina (Nestlé), Fancy Feast (Nestlé), Iams (Mars), Whiskas (Mars), and Dine (Mars).